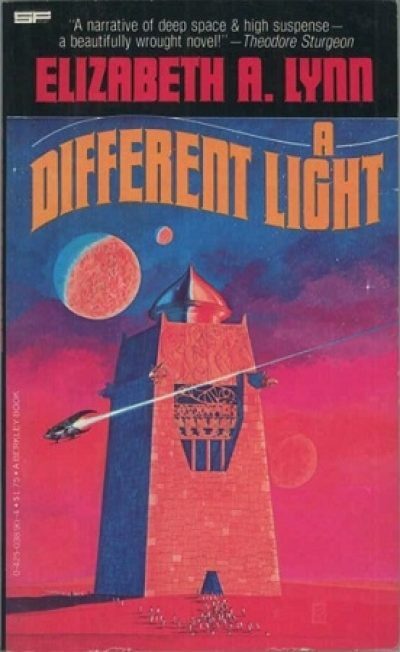 1978’s standalone novel A Different Light was written by Elizabeth A. Lynn. She is an author I enjoy..
Jimson Alleca has the bad luck (a one in a billion chance) to be an adult cancer patient in a galaxy where cancer is unknown. Modern medicine may have failed him, but it can at least offer him good odds of surviving until his fifties. Provided he is lucky. Provided his doctors can keep finding new treatments faster than the cancer can kill him. Provided he never, ever tries to leave his homeworld; the stress of travel through hyperspace would reduce his remaining years from twenty to one. Living to be safe may be extending his life but it’s killing his soul. Others may still applaud his art, but he can tell his development has stalled. When Russell, a former lover who left Jimson years ago, sends an enigmatic message, Jimson cannot resist the lure of mystery and escape. Better one year of glory than decades of stagnation. Two factors make the odds of finding Russell poor. Not only does Jimson have only a short time to live now that he has passed through the Hype, he has no idea where Russell might be, whether on one of the worlds of the Milky Way or in the new settlements in the Magellanic Clouds. Luckily for Jimson, Russell finds him. Now calling himself “Pirate,” Russell is what another author might have called a salvage expert, recovering items in exchange for large sums of money (Travis always limited himself to restoring stolen items, but Russell seems to have no such qualms). The next assignment will challenge even the seasoned and wily Russell. Enigmatic billionaire De Vala wants Russell to travel to 82 Eridani (a system dangerously close to a known navigational hazard) and to a planet that appears on no chart, to a temple worshipping unknown gods, to steal a mask of untold power. What could go wrong? And what better way for Jimson to spend his final months than accompanying his lover to a barbarian world whose inhabitants are unlikely to view the theft of their most sacred relics with favour? I am not a huge fan of books about artists … or authors. At least Jimson isn’t an author. And this book is really more about relationships than the agony of creativity. And it’s a caper novel, kinda, in the sense that Elgin’s looting of the Parthenon was a caper. Just a heads-up for people who don’t care for sad endings: the sad thing about fatal illnesses for which no cure exists is that the people so afflicted often die. Lynn softens the blow somewhat (in a manner which my reviewer’s oath compels me to conceal), but Jimson’s incurable disease really is incurable and travelling through hyperspace has exactly the effect on its progression that the doctors predicted. There is no magic cure waiting at 82 Eridani. Still, death was the coin Jimson willingly paid to accomplish goals that were more important to him than a chance of living twenty more years. Modern readers may be tempted to see the dying bisexual’s incurable ailment as a metaphor for AIDS. Do not fall to temptation! This novel predates the era when gay and bisexual characters seemed doomed to die of either AIDS or ham-fisted metaphors for AIDS. Although it certainly existed in 1978, AIDS was not clinically observed in the US until 1981; the term AIDS was not adopted until 1982. Jimson’s cancer is actually just what it says on the tin. As bad as cancer is now, survival rates used to be much worse. Jimson’s condition reflects the time the book was written. There are a number of possible explanations for the survival of a barbarian world in a galaxy overrun with starships. Author Lynn chose the explanation that FTL routes don’t map one-for-one onto regular space. 82 Eridani is close enough to the Solar System that it was initially settled by a generation ship, but FTL routes are such that it is hard to reach by FTL. With lots of other planets to explore, no one bothered with this one for a long time. Once it was re-contacted, the galactics decided to apply something like Star Trek’s Prime Directive1. Hands off the natives! Unfortunately, it seems that settling even comparatively habitable worlds can have ugly failure modes when the colony is cut off from regular contact. One plot twist surprised me: the person who throughout the book seems destined to be the Big Bad turns out to be just another pitiful, fallible human. He’s not dealing with incurable cancer, like Jimson, but his problems are just as inescapable. His vast fortune can only manage them, not than resolve them. Disco-Era readers might have been surprised to learn that Jimson’s big love was another man. Or that everyone in this world of tomorrow seems to be polyamorous. Or that a high fraction of the population seems to be bisexual. Of course, these days such things are hardly worth noting … but bear in mind that when this book came out, Lawrence v Texas was still a quarter-century in the future. The 1970s were in general a time of experimentation. Sometimes these experiments worked (the EPA) and sometimes they didn’t. Like polyester. How could everyone have thought that wearing garish clothing made out of solidified napalm was a good idea? And then there were the folks experimenting with homosexuality, bisexuality, and polyamory. Just because the legal systems of the world dragged their feet on such matters does not mean all SF did or that Lynn’s readers did. One suspects Lynn’s fanbase sought out her book specifically for LGB-friendly themes. In fact, one influential LGBT bookstore, A Different Light, took its name from Lynn’s novel. A Different Light is available here (Amazon) and here (Chapters-Indigo). Please email corrections to jdnicoll at panix dot com. 1: Another factor in the isolation of this world is the draconian regulatory system the galactics have created to prevent interstellar drug smuggling. Making it difficult for people to travel without being closely monitored is just part of an ongoing War on Drugs. See also The Sardonyx Net for some unintended consequences of this policy.